Warning: If you’re on your way to visit Rome, don’t read this. Our Italian driver is not of the Armani suit tribe. Carlo wears comfy jeans, has long shaggy hair and an unkempt beard. He also has the fabulous Roman nose of his ancestors as made immortal in ancient statues and sculptures. He looks like a scruffy Roman god. Seems like a good beginning for an Italian vacation, don’t you think? We just got off the plane and he’s driving us to our B&B in Rome. No sooner has Carlo plunked himself into the driver’s seat, than he takes off like a rocket to Mars while talking on a cell phone and driving with one hand. My limited Italian only serves me to understand that he’s in a hurry and has another pickup somewhere. It’s raining lightly but his right windshield wiper is groaning in a death struggle and the one in front of him is going through rigor mortis and is not doing any wiping at all. Cool Carlo puts the phone down on the seat next to him and I realize it’s one of a collection of four. Four cell phones, I kid you not. In front of him on the dashboard are two untidy piles of paper and file folders. The place looks like the office of a homeless bureaucrat. We steam out of the general airport area and find ourselves on the main highway leading from the town of Fiumicino (where the airport is) to Rome proper. It’s three lanes of traffic each way, and a goat track this road is not, let me assure you. It’s raining, and the wipers are not working, or did I mention that already? Our Roman god reaches for one of the piles of paper and puts it on his lap. He ruffles through it and takes out a sheet of paper full of indecipherable scribbles. He starts to write, head down, eyes on the paper, one hand on the steering wheel. Minutes go by. The car is slowly drifting to the left into the other lane. I’m speechless with terror. He rips off a small scrap of paper, opens the window a crack and pushes it out into the great wet yonder. He takes the opportunity to look at the road by leaning over to the right and glancing out of the window in front of the passenger’s seat, the part in front of him being un-look-throughable. He steers the wandering car back into its own lane and hits the accelerator. We are tearing down the road at suicidal speed. Thank the gods there is not a lot of traffic because Kamikaze Carlo reaches for another pile of paper and goes at it again: reading, writing, tossing another piece of paper out the window, and talking enthusiastic Italian on one of the four phones. The conversation concluded, he continues scribbling some more, head down, eyes on the paper, one hand on the steering wheel. I am now duly impressed by his skill in multitasking. Also I am frozen in terror as I look ahead through the window, seeing nothing because it has all fogged up on the inside and he has not noticed because he is studying for his doctoral degree in nuclear science. Looking out of the side window I see we are drifting off into the other lane again. Fortunately it has stopped raining. He rips off another piece of paper, opens the window again, pushes it out and now leaves the window open a bit to clear the fogged-up windshield (I assume). He does not wipe it. One of the phones rings. Another discussion ensues, which gives him another opportunity to steer the car back into its own lane of traffic once he notices it’s meandering. I did not come to Italy to die with my prince in a car crash right before Valentine’s Day. What an unromantic death! No, I came to Rome to live! To eat and drink! To gawk at old buildings! To watch Rome’s finest strutting their stuff in front of the United Colors of Benetton! Carlo shuffles more paper, pushes the pile back onto the dashboard and grabs the other stack of files, all the while talking on one of his four phones. Then he’s back to work — writing, reading, head down, eyes on the paper, one hand on the steering wheel. This goes on for twenty days minutes until we enter Rome proper and then he stops reading and writing and seems to pay more attention to the traffic. However, he still talks on two of his four phones, but really, I’m not complaining. I’m too busy trying to breathe again. We arrive at the palazzo (old apartment building) that houses our Bed & Breakfast. We’re physically unscarred but emotionally traumatized. Crazy Carlo helps carry our luggage into the poorly lit, ancient building. I’ve never been happier to see an elevator dating from Caesar’s time. Well, yes, of course. He hands over the banknote and I take it and see that it’s some mystery money I do not recognize. My spouse offers up his sincere apologies, digs into his wallet for the real deal euro note and hands it over. Our Roman god bolts out of the building. And what was that mystery banknote of fifty, you ask? Ukrainian money, left over from a recent business trip. The value? About 4 euros, 4.5 dollars. There would have been a certain karmic justice in it if Kamikaze Carlo wouldn’t have noticed, don’t you think? Do you have a story about a crazy driver? Please hit the comment button and tell me. I’m holding my breath! I once sat on a Turkish bus weeping as the driver careered around hair pin bends on the wrong side of the road on a deathtrap mountain road. Why is it that the worst drivers in the world are taxi drivers or bus drivers?! Haha! Loved the story and am glad you lived to tell it! plenty of crazy drivers down here too…. Mary, I love your taxi stories! It’s a miracle you’re around to tell them! I’m hoping to get some good stories out of our Turkey vacation, but I really don’t need any more scary taxi driver adventures! Actually our guy did not run an official taxi. We’d been handed off to him by the guy who was supposed to pick us up, but we were so late that he already was dealing with his next pickup. I considered telling him to pay attention to his driving, but he was so hyperactively multitasking that I thought he might get irritated and so make things worse. Once you’re on a big high way it’s not easy to turn back, either. Anyway, I survived! I think Carlo has relatives in Moscow. One of the taxi rides of my life was there. Well, it wasn’t the first time in twenty-six years that it snowed in Rome. It snowed last year, but that snow lasted only about half an hour and melted almost immediately. What made this year’s snowstorms in Rome so remarkable is that the snow stuck around for quite a while. No idea what he was doing or why he threw these scraps of paper out of the window. It was quite a show, watching him work! When I was in Rome I learnt from Italian drivers not to pay any attention to anyone behind you: just the ones in front. Which worked fine until all those awful scooters started appearing and making my life a misery! The worse driver I ever encountered though was a very tired driver who actually fell asleep while going at about 80 km an hour. It was an experience that’s for sure! Oh, perfect! Love your Cairo driving tale. This not-making-eye-contact technique is also employed in other places. Yerevan, Armenia comes to mind. Very dangerous there, but not as huge and chaotic a place as Cairo. Armenia is a very safe place to live in almost all respects; the most dangerous thing there is to try crossing the street. Drivers make it a sport to see who they can wipe off the face of the earth. Taking a Tukh Tukh from Kochi, India to the coast, a less than 20 km drive. Unfortunately we stumbled upon the Craziest Tukh Tukh driver in town, who gave us Thelma & Louise moment upon Thelma & Louise moment. We eventually made it to the coast. We politely declined his offer to wait for us until we wanted to return into town…. When I read about tour busses going over a cliff, or a cruise ship sinking, I always think that only happens to other people far far away, not me. Right? So I have nothing to worry about. Unless I’m in a Volkswagon cab in Mexico. My driver explained it’s only the slow drivers that get crunched. So there you go. 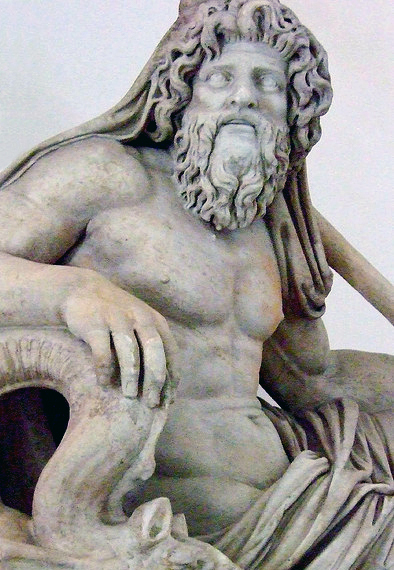 Your scraggly Roman God multi-tasking driver probably avoided many perils you didn’t even notice. And, you didn’t get mugged.